The Memory window displays the memory area content. Several memory windows can be used at a time. Open the windows from the toolbar or using the menu View - Memory Windows. Address Enter an expression that evaluates to a memory address. Black - CODE memory area or uninitialized RAM. Red - CONST data in Flash or ROM that has been accessed at least once. Gold - memory location that has been initialized, but not accessed yet. Green - memory location has been accessed at least once. Whenever program execution is halted. During program execution when View - Periodic Window Update is enabled. When clicking the button Toolbox - Update Windows. Lock buttons freeze/unfreeze the window content temporarily. Add the Address to another debug window. Default: The target driver decides which access size to use. 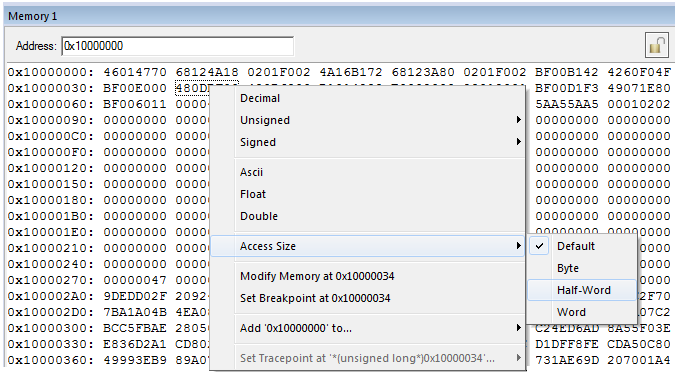 Can be a mixture of 32-/16-/8-bit accesses; the actually used access size is, for example, influenced by the alignment and the number of bytes to access. Byte: Only 8-bit accesses are used. Half-Word: Only 16-bit accesses are used. Word: Only 32-bit accesses are used. Unaligned accesses will be extended to aligned accesses if having selected one of "Byte", "Half-Word", and "Word". Unaligned write accesses can result in read-modify-write accesses to the concerned memory.